I've been blogging for a while now, but reading through some of my old posts I've noticed that I haven't really talked about myself much (sewing aside). So I've seen people do this on other blogs I read and decided to give it a go myself, so here are 5 interesting facts about me! 1. I am a vegetarian. I have been for almost 11 years now, and can honestly say I do not regret this decision. I was 13 when I told my mum that I didn't want to eat meat anymore, and her reaction wasn't the best! I think she thought that it was a phase, and that i'd give it up after a couple of months. However when i had reached my year anniversary I think that's when she realised that I was serious about it. Whenever people discover that I'm vegetarian the first question I always get asked is 'Why?' The truth? It's a mixture of reasons really, when I first gave up meat it was right after we had the series of science lessons in school that involved dissection. I guess when your face to face with the thing that's usually on your plate covered in bread crumbs, and you're told to take apart its heart, that does something to a girl! I then started to research into vegetarianism a bit more, and the more I read, the more I hated the thought of eating meat. Throughout my 11 years of eating this way I've come across a lot of negativity from people, which you might/might not find surprising, this only encourages me more as I believe that what I'm doing is the right choice for me. 2. I am somewhat heavily tattooed. I have both arms filled, my right side, and some small pieces on my back. I had my first tattoo when I had just turned 18, and it's some artwork from the cover of an Incubus album. 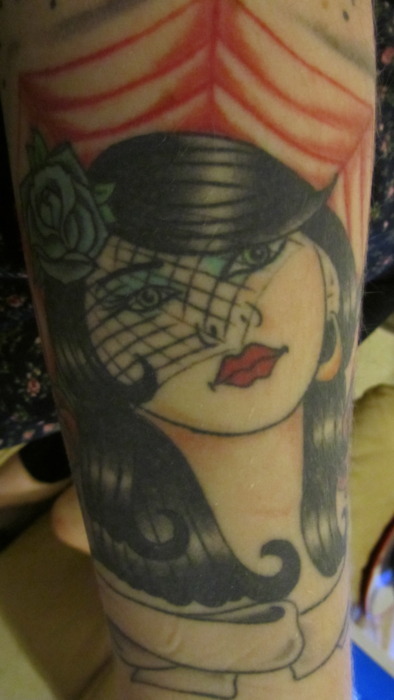 My second tattoo is on my arm (buried around everything else) which I designed myself and its inspired from another piece of artwork from an Alice In Chains album. My third tattoo is of a purple lily which sits on the bottom left side of my back. I then had 2 nautical stars added either side of my Incubus tattoo. 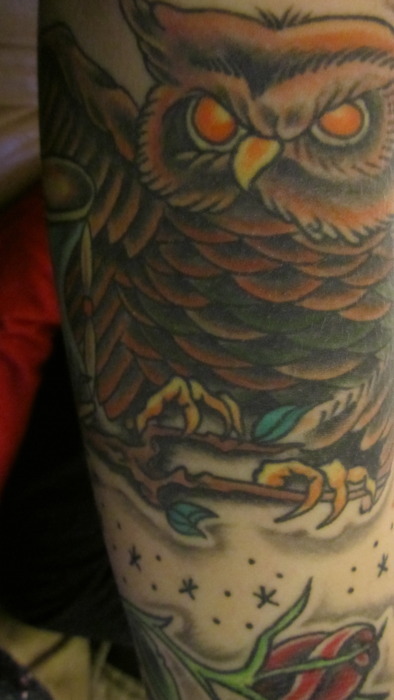 Then came my arms...my left arm was first, and is inspired by the traditional style of Sailor Jerry, it includes an owl, a candlestick, a gypsy head, a dagger, and a portrait of a woman. 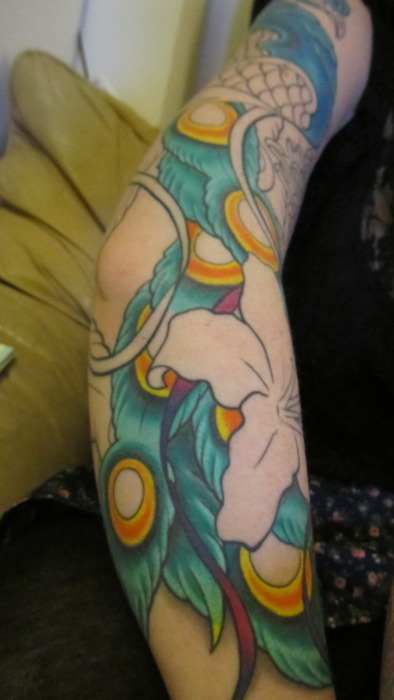 My right arm which is still being worked on, is of a peacock surrounded by lilies and Japanese chrysanthemums. My side piece was a gift from my tattooist for being a loyal customer, and is of a portrait of woman captured in an antique frame. 3. I've recently started collecting Russian Dolls. I just love the way they look, and that there are so many types out there! 4. I love old movies, especially musicals. I grew up watching with my mum, and it's something that's stuck with me. I grew up watching Fred & Ginger, Elvis, Barbara Streisand, Marilyn Monroe, and Judy Garland. Some of my favourite movies ever are Blue Hawaii, Hello Dolly, Wizard of Oz, Gilda, Breakfast at Tiffanys, West Side Story, Rear Window, Some Like It Hot, and State Fair. As well as more recent (ish) films like The Breakfast Club, Mulholland Drive, The Big Lebowski, 500 Days of Summer and Anchorman. 5. I love 'Cult' television. Anything slightly supernatural and i'm hooked! I grew up watching Buffy the Vampire Slayer/Angel and I collected pretty much anything that had the logo plastered on it, I even went to a convention and met some of the cast (Xander/Nic Brendon is a sweetheart). I also love Twin Peaks. If you've never watched it, and you're interested in spooky TV then I highly recommend it, it's the perfect mixture of supernatural drama and comedy. Other favourites are of course The X-Files, and Supernatural. I hope you've enjoyed reading this, and that this gives you an idea of who I am besides being a sewing maniac!! I very much enjoyed reading more about you. I love Russian dolls. How much more could we be alike??? I LOVE Buffy, it is and always be mine & my sister Bex's all time favorite show. Willow was my favorite and Bex loved Buffy, I also adore Russian dolls.